I've been complaining so much about my camera lately that it decided to break down for good, just to spite me. I'm stuck now with my phone I guess for a while. can't really afford a new camera but I'll have to come up with something pretty soon. 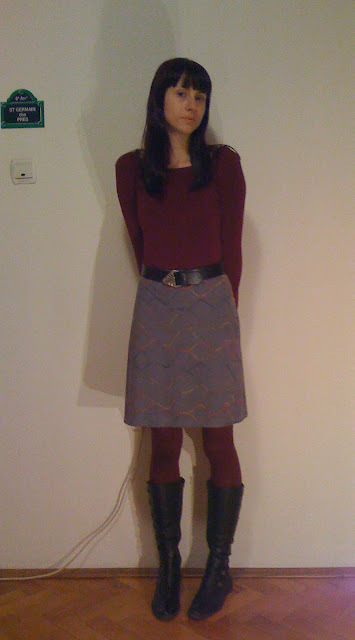 my mood was still up considering all this, so I managed to pull together a colored outfit for a change. I found a skirt that I had forgotten about deep down in my closet. it's the softest thing you've ever touched. It's some sort of a suede or maybe velvet, I dunno, I'm not very good at naming fabrics, especially in english. anyway, it's grey and has these pretty multicolored stitchings on it. 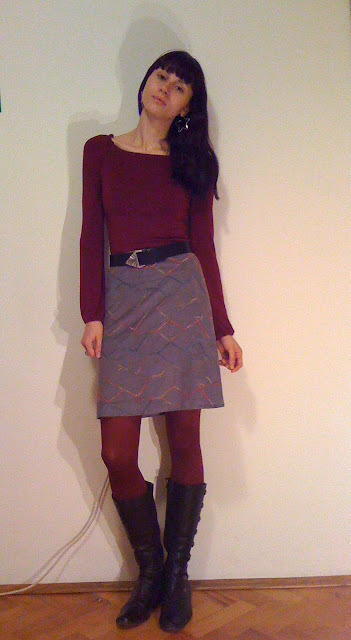 I paired it with matching burgundy top and tights. I'm really into belts right now so I added a hand me down belt from my mom's cousin. I remember I used to borrow a lot of clothes from her in high school. she was so cool, she would help me with DIY projects and sometimes she would let me keep the items I took from her. I miss those days. really cool skirt!!! I love how you matched the top to the tights! I love this outfit ! I too am fighting with my cameras ! Glad I found you ! I try not to, but am always trying out new camera techniques and sometimes ask other bloggers how they get their good shots! I have a "good" camera (Canon Rebel 12.2) and a "cheapo" (Easyshare 3.1) and really can't afford another one, but I found some small ones at wal-mart that were less than $20 and had a 12.2 megapixel. I may try one, but the problem lies in depth of field (how far the lens will pick up a good shot ) most cammy's only have a 3-4 ft. "good" range, and a full body shot takes 5-6 ft. thus, over-exposure or underexposure! Yikes ! Sorry I am rambling! best of luck with your photos! I also love the title of your blog. I have buddha all over my house and try to keep the buddha smile ! nice to meet ya!